The genuine Lexmark 100 Magenta Ink Cartridge provides vibrant, intense colour on a long-lasting scale. Compatible with a great many printers, and simple to install, the genuine magenta ink cartridge is certain to provide stunning results in all your print jobs. Lexmark are a trusted brand, known for the durability and reliability of their ink cartridges, as well as for the vivid, professional quality print jobs they provide. Even better, all our cartridge prices include free UK delivery and 90% of orders are received by customers the next working day. 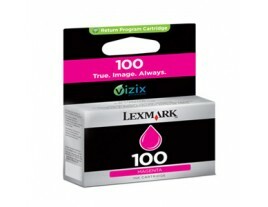 You simply can't go wrong with the genuine Lexmark 100 Magenta Ink Cartridge.